It was January 1945, the Battle of the Bulge was coming to an end and 21 year old Lt. Donald Clark found himself piloting a C-47A Skytrain over the Western Front. Its cargo bay, loaded with gasoline and ammunition, was on its way to Lt. Gen. George Patton’s 3rd U.S. Army and its tanks, as they began their push into Germany. 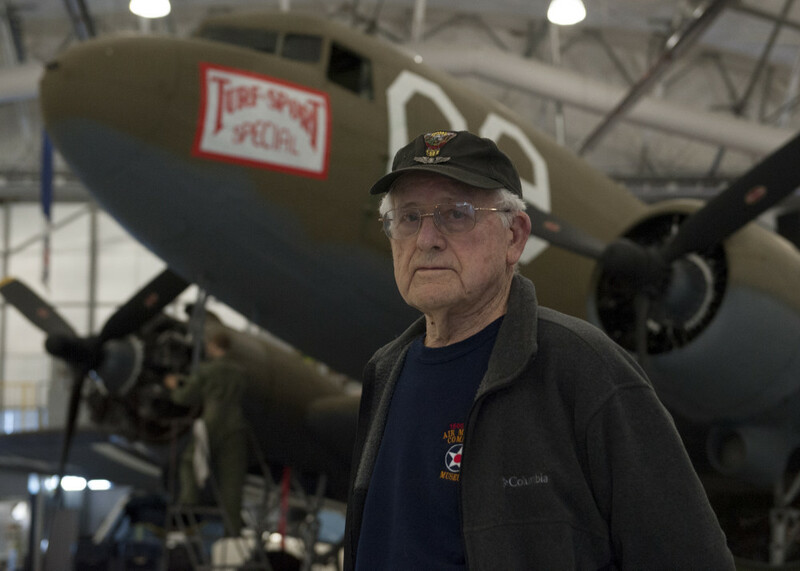 Flash-forward 70 years; you will not find Clark, who is now 91 years old, flying C-47s. You will, however, find him most Wednesdays at the Air Mobility Command Museum educating and sharing his stories with younger generations. It only took an early graduation, a white lie and a few rigorous months of training, for Clark to find himself in the cockpit of the C-47A. But Clark’s story started years earlier on a quiet family farm in the heart of Delaware. As a young child, Clark’s passion for all things aviation began to sprout. “I was a farm boy and I always wanted to fly,” said Clark. As Clark progressed through school, his studies focused primarily on an agricultural vocation. Nonetheless, his passion for aviation continued. Clark was like most young men of his age at that time, swept up by the war. As a high school senior, he applied and was accepted into an aviation cadet program. But before his acceptance was made official, he had to receive his parents’ permission, but more importantly, their signature. Because Clark came from a farming family and their farm exceeded a certain acreage, Clark would have been exempt from the draft and military service. After telling this white lie to his parents, all he had to do was wait for graduation the following May and he would be sent off for cadet and flight training. Clark was confused by this, previously believing that he could not be called up until after he graduated a few months later, not a mere few weeks. His principal informed him that he was lucky that the Delaware State Legislature had just passed a law allowing schools to give students in good standing an early diploma in an effort to support the war. Within a few weeks, Clark was in Birmingham, Alabama for pre-cadet training. This in short, was six demanding months of college classes, primarily focusing on physics. Upon completing this, Clark was sent to a classification center in Nashville, Tennessee. Initially, Clark was assigned to fly A-26 Invaders, but was soon transferred to the newly activated 1st Troop Carrier Command, where he would soon learn to pilot C-47s. Clark completed all three required phases of training, racking up over 200 flight hours and was selected to become a 1st pilot, today known as a command pilot. Clark was now fully trained to be sent to Europe. When Clark arrived in war-torn France on Jan. 1, 1945, it had already been seven months after the Allied invasion at Normandy; the Germans’ last ditch counter-offensive (the Battle of the Bulge) was crumbling and the Allies would soon be entering Germany itself. Stationed near the front, just outside of Paris, Clark and his crew were broken up and assigned to different aircrews. For the next five months as the war went on, Clark flew a total of 81 missions, 27 of those being credited as combat missions. The majority of these missions saw Clark and his crew flying their C-47 to the front lines, loaded with ammunition and gasoline. On their return flights, their aircraft was usually loaded with the wounded for transport back to France or England, depending on the severity of the wounds. Clark recalled one of his most unforgettable and adrenaline pumping missions. Clark and his crew were instructed to fly to a field just outside of Reims, France, and wait. Hoping for something exciting, Clark was humorously surprised with what he had to do. Clark could not believe what his cargo was. Returning from the mission, he and his crew became the subject of many jokes from the other aircrews. With the war in Europe ending in late spring of 1945, Clark continued on in Europe, flying for the newly created European Air Transport Service. Even though this service acted as a civilian airline, transporting people all over the continent, the aircraft and crews were from the Army Air Force. During his time in EATS, Clark was given the opportunity to fly around many VIPs and was eventually offered a pilot job from Trans World Airlines. They wanted him to fly a converted C-47, based out of Geneva, Switzerland. But Clark decided against this. Returning home and not wanting to give up his passion of flying, Clark utilized his knowledge of both aviation and agriculture to start a successful crop dusting business. He sold this business to start a seed business that still operates to this day, Clark Seeds in Clayton, Delaware. Besides this, over his lifetime, Clark served on the board of directors for two Delaware banks, on the board of directors for the Federal Reserve Bank in Philadelphia, on two school boards and was eventually elected to the Delaware House of Representatives for 12 years. However, Clark always maintained a love and interest in aviation. This is what brought him to the AMC Museum. After a few years and his retirement from his seed business, Clark began volunteering at the AMC museum. The individual who approached Clark and asked him to volunteer was Mike Leister, AMC Museum director.